The new range of Eyezen™ lenses: what are the benefits perceived by wearers during screen use? With recent technological advances, ophthalmic lenses can now offer more than just good everyday vision. They are also aiming to meet emerging needs arising from connected life. 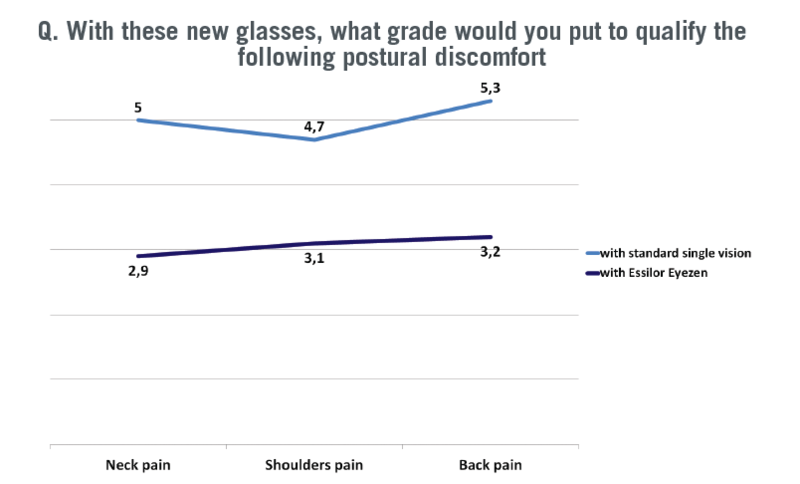 Innovations are put to the test by specialized research institutes to measure user satisfaction and the effects of lenses on postural and visual fatigue during screen use. The new Essilor® Eyezen™ lenses were tested in an independent study before they were placed on the market. This article describes the results obtained with a population of ametropic patients wearing single vision lenses. Essilor® Eyezen™ lenses were defined according to Essilor’s R&D programme: LiveOptics. This programme includes four major steps for the introduction of a new design. Tests conducted with consumers known as “wearer testing” constitute the fourth part of this programme. Because the best evidence is provided by the wearer, it was essential that this new class of Eyezen™ lenses be tested and approved by the final consumer. To ensure the impartiality of this type of test and lend credibility to the key role assigned to the wearer in the quality process, testing protocols are validated by independent research institutes. The latter, which hold large consumer databases, are in charge of implementing questionnaires for the purpose of evaluating the objective and subjective performance of Essilor® products. To focus attention on the consumer benefits of the new class of Eyezen™ ophthalmic lenses, Essilor contacted Eurosyn, a French market research institute specializing in sensorial analysis. In cooperation with this institute, Essilor established a test protocol for the purpose of validating the performance of Essilor® Eyezen™ lenses with a target group of ametropic subjects. The purpose of this study was to verify whether or not an effortless transition from standard single-vision lenses to Essilor® Eyezen™ lenses was possible for persons with refractive error. More specifically, the goal was to determine the perceived benefits of this new range of lenses during digital device use. The Essilor® Eyezen™ range comprises three new products: Essilor® Eyezen™ Initial 0.4, Essilor® Eyezen™ Active 0.6 and Essilor® Eyezen™ Active+ 0.85. These three additional refractive powers were all tested during this study. Thin lenses (n = 1.67) equipped with Crizal® Prevencia® coating were chosen for this study. The lenses were optically centred on the height of the pupil, taking into account the measurement of the pupillary distance for far vision. Before beginning the wear period, each of the testers answered a quantitative questionnaire to assess their general satisfaction and the level of visual fatigue experienced (if any) with their usual eyeglasses (standard single-vision lenses). Each tester was asked to wear Essilor® Eyezen™ lenses instead of their main pair of usual eyeglasses for four weeks. These tests were performed “blind”, i.e. the subjects were given no information on the type of lenses being tested, and the prescription for these lenses was exactly the same as the prescription for their previous pair of glasses, to avoid any bias related to the new refraction. At the end of the wear period, the consumers evaluated the performance of the Essilor® Eyezen™ lenses by completing an online questionnaire. This questionnaire was used to quantify wearers’ satisfaction in terms of visual comfort during the performance of everyday tasks, and more specifically, during tasks related to the use of digital devices. Inclusion criteria were: 1/ Be between 20 and 55 years of age. 2/ Be a user of digital devices (for at least 6 hours a day), 3/ Alternate between different screens. 4/ Present symptoms of visual fatigue and/or postural discomfort. 5/ Be ametropic and wear standard single vision lenses to correct distance vision (DV) with or without anti-reflective coating. 6/ Have a prescription less than 1 year old. 7/ Have a correction of: -4 <Sphere < +4 /-2 <Cylinder<2. 8/ Not be a wearer of progressive lenses. Exclusion criteria were: 1/ Associated strabismus and amblyopia. 2/ Anisometropia greater than 1.5 dioptre. 3/ Diabetes, glaucoma or other eye diseases. Wearers were recruited online by Eurosyn. The institute then contacted each subject to discuss their availability for appointments: the first to select the test frame and take all necessary measurements; and the second, to be fitted with the eyeglasses to be tested. During this appointment, visual acuity testing for distance vision (Monoyer scale) and near vision (Parinaud) was performed. For this wearer test, the sample population was divided into three groups, depending on the wearer’s age: The first group of 25 wearers, aged 20 to 34, were equipped with Essilor® Eyezen™ Initial 0.4 lenses; the second group of 31 wearers, aged 35 to 44, were equipped with Essilor® Eyezen™ Active 0.6 lenses; and the last group of 20 wearers, aged 45 to 55, were equipped with Essilor® Eyezen™ Active + 0.85 lenses. Figure 1 shows that ametropia distribution is representative of non-presbyopic wearers of single-vision lenses. Cylinder distribution is shown in Figure 2. It indicates a high percentage of low astigmatism values with 75% of the sample having a cylinder of less than 0.5 dioptre. The results concern the entire Essilor® Eyezen™ range, including all three additional refractive powers (0.4, 0.6 and 0.85). They are consolidated over the complete sample. Seventy-six wearers tested the Essilor® Eyezen™ ophthalmic lenses for four weeks. In this type of test, the first criterion to be verified is adaptation. The wearers reported that adaptation to these new Essilor® Eyezen™ lenses was easy (‘fairly easy’ to ‘very easy’), and 83% were satisfied, all additional refractive powers combined. As regards rapidity of adaptation, 79% rated it as rapid (‘fairly rapid’ to ‘very rapid’). The testers wore the Essilor® Eyezen™ lenses on a continuous basis throughout their activities (including during their use of digital devices). In fact, 94% of them wore the Essilor® Eyezen™ lenses more than four hours a day and over one out of two testers wore Essilor® Eyezen™ all day long (see Figure 3). A first observation was made on visual fatigue symptoms and postural pain felt by subjects. All wearers recruited for the test previously experienced ocular or postural discomfort during screen use. At the end of the wear period, all wearers reported that they felt less visual and postural discomfort while using their digital devices. 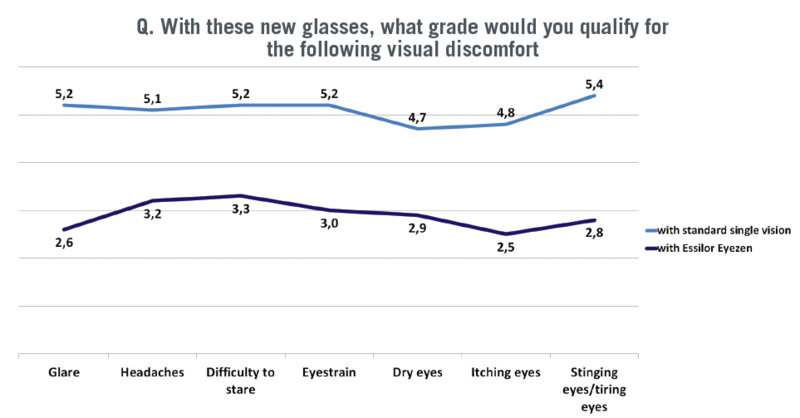 They stated that this discomfort was less frequent and less intense with the test lenses (Figure 5). The remainder of the analysis was aimed at identifying the benefits perceived by the subjects while wearing Essilor® Eyezen™ lenses. 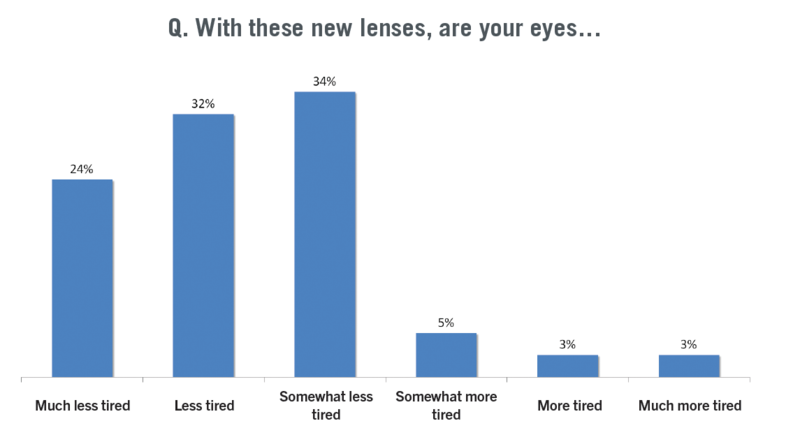 At the end of the day, 90% of wearers state that their eyes are less tired (‘somewhat less tired’ to ‘much less tired’), in comparison with how they felt with their old eyeglasses (standard single-vision lenses). 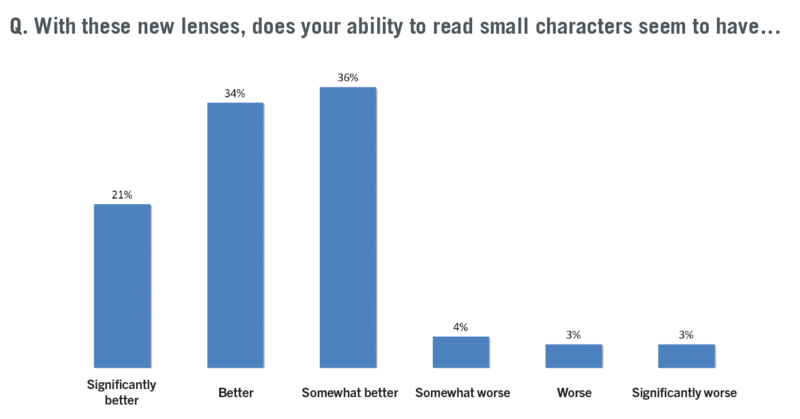 In addition, 91% of wearers who tested Essilor® Eyezen™ lenses felt that they had less difficulty reading small characters, particularly during smartphone use (Figure 7: ‘somewhat better’ to ‘significantly better’). Moreover, 90% of wearers reported that light from screens caused less glare, as indicated in Figure 8. 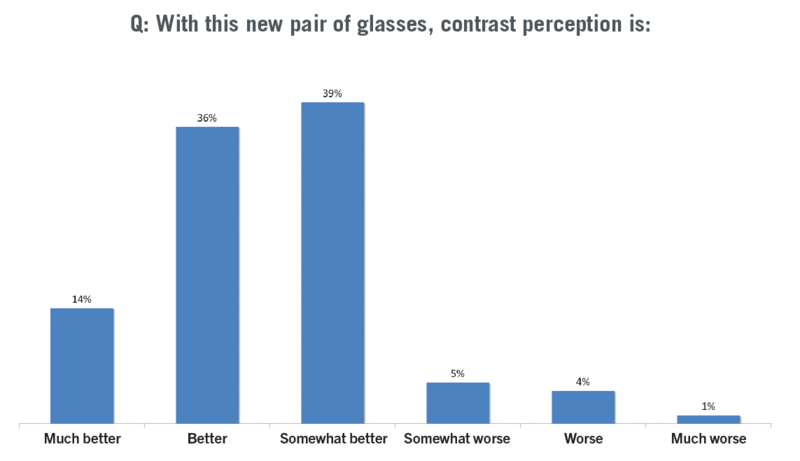 It is also noteworthy that 89% of wearers had improved perception of contrasts with Essilor® Eyezen™ Crizal® Prevencia®, in comparison with their previous eyeglasses (see Figure 9). In addition, the study evaluated visual comfort during the use of digital devices, as well as the general satisfaction level. Indeed, 91% of wearers reported having comfortable vision during screen use with Essilor® Eyezen™ lenses (see Figure 10). 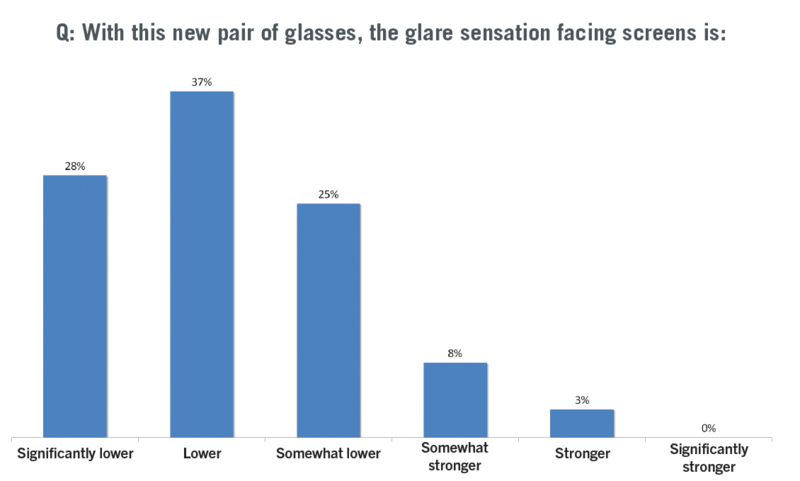 83% of wearers were very satisfied with the level of on-screen comfort provided by these new lenses. On average, 72% of wearers were satisfied with their visual comfort using a computer compared to their previous eyeglasses. The final result, at the end of four weeks of testing, indicates that 91% of ametropic wearers were satisfied with Essilor® Eyezen™ (see Figure 11), with a satisfaction level ranging from 7-10 on a scale of 10. It is also noteworthy that 78% of wearers reported being very satisfied with the new Essilor® Eyezen™ lenses (with a score of 8-10 on a scale of 10). This demonstration of performance over the entire Essilor® Eyezen™ range was verified for each of the additional refractive powers (0.4, 0.6 and 0.85). 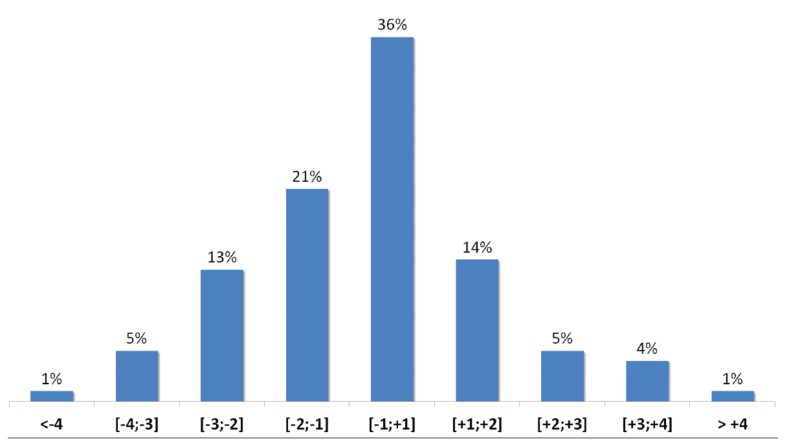 All three ophthalmic lenses provided an equivalent level of satisfaction for the individual testers, as indicated in Figure 12. Essilor® Eyezen™ lenses were tested and approved by ametropic consumers, who previously wore standard single- vision lenses, with very good results. Indeed, 91% of them were satisfied with the new Essilor® Eyezen™ lenses, regardless of their additional refractive power. Throughout the testing, we observed that wearers preferred Essilor® Eyezen™ lenses to their previous eyeglasses by a wide margin. They reported that their eyes were less tired and that they had less difficulty reading small characters. Finally, during on-screen use, their impression of glare also seemed to have decreased while their perception of contrast increased. In addition, this new type of lens can completely replace a standard single-vision lens, throughout the day for all types of activity. In fact, 94% of wearers, all prescriptions combined, wore these new ophthalmic lenses for a minimum of four hours a day. In conclusion, Essilor® Eyezen™ lenses, combined with Crizal® Prevencia® coating, were truly appreciated by wearers. Today, 93% of them continue to wear their new eyeglasses, and 88% would recommend this new type of ophthalmic lens to their families and friends. • Essilor® Eyezen™ ophthalmic lenses combined with Crizal® Prevencia® coating were approved during a wearer test conducted by an independent institute. • The results showed a reduction in all symptoms of visual and postural fatigue. • A reduction in glare and improved contrast were demonstrated during the use of digital devices. • 91% of wearers reported having comfortable vision during screen use, and 91% expressed satisfaction with Essilor® Eyezen™. • Essilor® Eyezen™ lenses are proving to be an appropriate solution for the emerging constraints arising from connected life. They are suitable for replacing standard single-vision lenses.